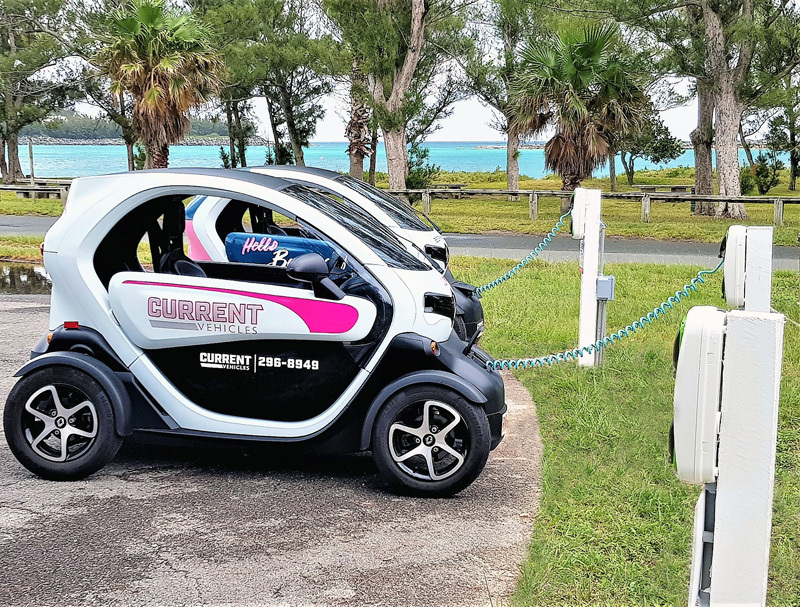 Twizy electric rental cars can now be charged while visitors enjoy a day at Clearwater Beach in St. David’s, as the Bermuda Land Development Company Limited [BLDC] have installed eight dedicated charging points in the area. The two-seater Renault Twizy minicars have been available to rent from Current Vehicles in Bermuda for just over a year. “Since their introduction, Twizys have proved to be incredibly popular with visitors,” said BLDC’s Chief Executive Officer, Francis Mussenden. “This is just one part of our commitment to improve the experience at Clearwater Beach for everyone. We have upgraded the parking lot at Turtle Bay and the restroom facilities have been renovated,” Mr. Mussenden added. Piers Carr, Chief Executive Officer of Current Vehicles, said “We set out to make Bermuda more accessible than ever by giving our customers the means to safely explore the Island at their own convenience. There is no fee for topping up a Twizy at the Clearwater charging stations. Any idea roughly how much it would cost to fully charge one of these things? if ya have to ask,you cannot afford it! figure it applies to your question too!! please can BLDC block up the gap in the fence by Clearwater where bikes can drive through to the protected nature reserve? Aren’t these only supposed to be rented to tourists? I see locals driving them around. Rental bikes are rented to both visitors and residents. What’s your point? And why in the world should locals not be able to rent them? Or buy them for that matter? If you are a single person and don’t feel comfortable riding a bike due to how incredibly dangerous the roads have become and you don’t want to rely on an unreliable bus service then one of these is perfect to buy. who payes for that power ? is there a coin slot or is it free of charge ?